Here is a quick introduction to using DS1302 based clock module. This will provide you with an entry point to using timing that is maintained externally when power is not as accessible. 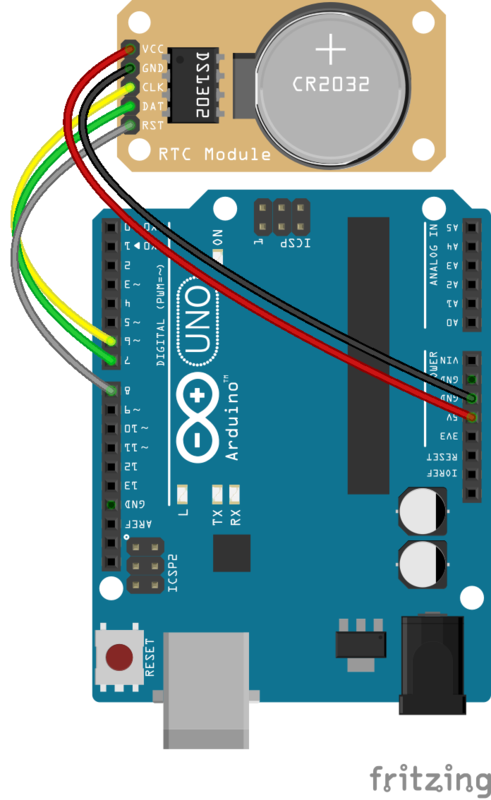 This example will demonstrate the use of an Arduino UNO in setting the time and then reading the time from the module. Once connected and the program loaded, it will load a time and begin to read the chipset's time every second. This will use the DS1302 RTC library created by Matt Sparks to interface with the chipset. Wire the two boards together as can be seen in the image below, taking care to match the pin numbers. The code consists of an include, definitions, 2 functions, setup and loop. First the DS1302 RTC library is linked to the code. This is followed by the pin definitions and initilisation of the clock object used by the library. Next a function that converts the day output by the chipset into a string format. The second function interfaces with the chipset to obtain a time, then join the various elements to for a character array that will be handed back to the calling function. The setup initilises the serial connection. It then sets a date and sends it to the chipset to hold. These 4 lines are not required every time. The loop calls the time from the readTime() function and ouputs it to the serial connection, pausing for a second and repeating. Load the code below into the Arduino IDE and upload it to your board. and then read the time from it every second. Time t = rtc.time(); // get the time and date from the chip. // Loop and print the time every second. With the board loaded with the program and all the connections made the serial monitor should display a running time counting from the set time. The output should be as seen below.